Today, marks two years since my dad was shot and killed. This is not something I have talked a whole lot about here in this space, it has been a deeply personal, emotional experience and some details will be left only within my family, the part of this that I want to share today is how yoga and meditation have and are helping me through grief, trauma and loss. In March 2012, I was participating in Inner Evolution Yoga’s first ever 30 day yoga challenge. This month was pivotal in transforming my yoga practice. It helped me develop a stronger at home practice, find time for yoga in each day and feel the full benefits of a daily practice. I went to yoga on March 28th, 2012, like I had each other day that month, went home for the evening and fell into a blissful sleep, only to be woken up to find out my dad had been shot. I found out a few hours later, what I already knew instinctively, as soon as I heard the news, he did not make it. I spent the next hazy hours trying to make sense of the major shift that just occurred from underneath me and coming to the stark realization that I was next of kin and was expected to make some major decisions, and soon. Fortunately, my family was extremely supportive and helpful, and we moved through the arrangement process as smoothly as one can move through something of that magnitude. I had barely slept, and around 4:00PM on March 29th, I remembered yoga and the 30 day challenge. I was at my mom’s house at the time and said, “I guess I won’t be able to finish the challenge.” My mom looked at me and firmly told me to go, that I needed to continue with it and had done what I could for that day. My mom doing that gave me permission to start a path to healing. I remember driving up to the yoga studio that evening, and parking in the similar spot I had the night before and realizing how different everything was, from a mere 24 hours before. The whole world had changed around me, and I was a completely, shattered mess. I walked into the studio that day absolutely broken and shaken to my core, and in deep need of healing. I approached that first class back in a whole different way than I ever had before. I was incredibly vulnerable and completely surrendered to a process I did not quite understand yet, but I trusted. I felt safe at Inner Evolution Yoga. Philip and Sandrine (the owners), plus many of the other instructors have created a safe, loving community, that I felt OK to be vulnerable and broken in. 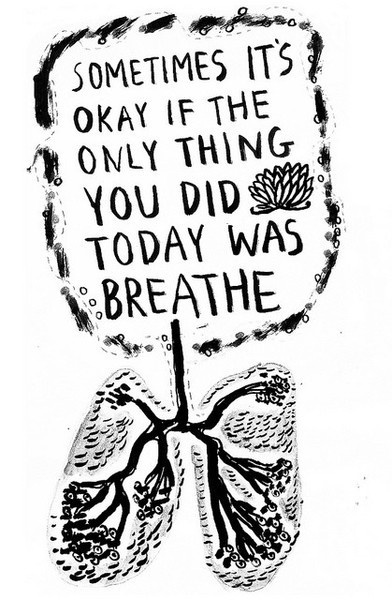 The only thing I felt I had control of that day, was my breath, so I worked on my yoga breathing in a completely different way, than I ever had before. I had never before realized how important that breath was, and I used it to keep me anchored. I finished that first 30 day challenge and instead of being stronger, more fit and zen at the end, like I thought I would be, I was in numb disbelief, stressed, shattered and confused. The next few weeks were a blur of funeral arrangements and planning. I went to yoga the morning of my dad’s funeral. I attended the 5:30 AM class and tried to wrap my head around the day I had to face. I continued to use my breath, which was really the ONLY thing I could work on and felt I could control. I completely fell apart as soon as I got in my car to go home. Yoga had opened me up and my emotions spilled out. This was SO incredibly needed after trying to maintain some semblance of strength to accomplish all the planning. I was able to completely let my emotions bleed through, and then I was ready to face a day I did not think I would see so soon. At 28 years old, I had to eulogize my father. I had to bury him. Falling apart that morning allowed me to garner some inner strength (that came from who knows where) and move through the day with courage. If you have ever had to be a planner of a funeral, you know that the day itself is not about you grieving. It is about keeping a schedule, making sure everything is executed as planned. The funeral is still a bit of a blur in my memory. I remember feeling dizzy and overwhelmed, but trying to keep everything on track. After the funeral, I knew I needed to face the situation and I knew I could either cope with this mountain of emotions positively, or negatively. I could easily bury my feelings and ignore them. I could drink them away and commiserate or stuff them with fatty foods, as they came up. I will not lie, I did a fair amount of all the above throughout my journey, but, I knew I had to do better. I decided I would not ignore these feelings and situations, but face them, sit with them, breath through them and process. Grief became a chore for a while, but one I knew needed to complete, to keep my head and heart healthy. I scheduled times of day to cry, I sat in my meditation corner and used my breath to help me sit with feelings. The first feeling was an overwhelming sense of anger that surrounded me like iron shackles. I am not an angry person by nature, and I wanted to get rid of these unhealthy feelings as quickly as I could. But, I also tried to find peace with this being part of my healing process, and I breathed through the feelings, till eventually, those shackles released. In the absence that anger left, sadness poured over me, till I nearly drowned. I was frequently weepy, despondent and oh, so sad. I would sometimes get down on myself for this. I like being a fun, good-natured person, and again, this felt foreign. Meditation helped, once again, with sitting with my feelings of sadness. The sadness still is, and always will be there, but not as prevalent. Currently, I am working through loss. I really came to cherish and need meditation to help me be OK with my current situation. Instead of letting thoughts of “I wish…” “It could’ve…” “If only…” pervade my thinking, like they once did, I begin to meditate more on “It is” and become more accepting of where I am and finding the peace in that. I used meditation to help me with the nightmares I was experiencing. I was constantly re-enacting my dad’s death in my head, even though I witnessed none of it. The horrifying images I would try to suppress through the day would break through at night. I started avoiding sleeping and was exhausted. I begin bringing those images in while I meditated and practiced breathing through them and finding peace with releasing them from my heart and mind. I did not need them, they were not serving me, forcing my mind into that level of trauma was not doing a service to my dad, he would not want me to go through that and it would ultimately not bring him back. Meditation helped me let that go. I approached yoga in a whole new manner. I no longer went to class for a good workout. I went to connect deeper with my breath, body, spirit and heart. I went to find peace, even amongst challenging poses, which helped me find peace when I was not on my mat. I go still, again and again to discover myself more and constantly improve. Yoga gave me the courage and strength to face the road I had to travel, and continue to travel. It helped me find peace, even in turmoil. It helped me be OK with a new reality, and instead of my mind spiraling to a place of anxious suffering (as it is prone to do), meditation and yoga have helped steady it. Yoga worked for me. I will not pretend like it is the path for everyone to deal with grief and loss, I can only share the benefits, in my own life. I am happy to answer any questions you might have, about how it could potentially benefit you. My dad was always proud of me. Some days, when I miss that, I remind myself, with assurance in my heart, that he would continue to be proud of the trail I struggle to stay on.